Internment or Detention Without Trial is nothing new to Irish people and has been used every few decades throughout our Nation’s occupation. Whenever Westminster chose to imprison and/or exile entire communities throughout the country. The Twentieth Century witnessed a number of phases of Internment in attempts to quell resistance to British Rule beginning after the 1916 Rising and ending in 1975. Internment conjurs up a collective legacy of a denial of justice, violence and brutality inflicted upon fellow citizens and communities. 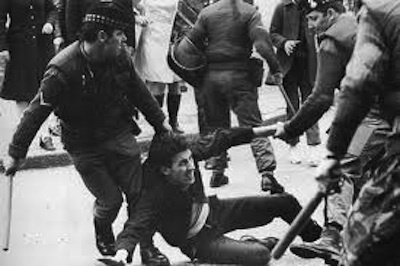 And so it was again on August 9th 1971, when hundreds of Republicans, Nationalists and Socialists were brutally dragged from their beds in dawn swoops by heavily-armed British soldiers and thrown into armoured vehicles and driven away to the cries of the mothers, wives and children. In Ardoyne alone, riots took place across the district as news of mass arrests spread from home to home. The Provisional & Official sections of the IRA in the area mounted a number of military operations to keep the troops out. Gun battles between Republicans & the British were commonplace throughout the day and the Woodvale Defence Association (WDA), forerunner of the UDA used Internment to force Catholic families from a dozens of homes in the Woodvale, Glenbryn and Ballysillan areas. They also wrecked and burnt hundreds of other homes that Protestants lived in Cranbrook, Farringdon Gardens and Velsheda to ensure Catholic families could not move into them. The British Army also went on the rampage in and around Ardoyne killing a Protestant householder, Sarah Worthington in Velsheda, claiming she had a rifle? To date, no member of the British Crown Forces has been made accountable for her murder. They were also firing wrecklessly into Etna Drive and Jamaica Street for hours from Glenbryn, until the IRA returned fire. During the ensuing battle, dedicated Volunteer, Paddy McAdorey was killed defending his community. Internment had a massive impact on Nationalist Belfast and communities including Ardoyne responded in the only way they knew how, with riots, burnings and trouble. Political representation in the Six Counties during the Seventies was pretty grim and the SDLP, encouraged a general boycott of the Unionist and British Authorities. Although, they later, failing the electorate by embracing the system and helped criminalise those who supported the Civil Disobeience campaign. Over the next five years, many who believed in human rights campaigned for the prisoners, took to the streets, protested, refused to pay rent for council houses and marched. The British criminalised entire communities due to their support for the Internees to the extent that they gunned-down 14 marchers in Derry during an Anti-Internment Rally on January 31st, 1972. Branding them gunmen and bombers, a final act of injustice. Throughout the remainder of the Seventies, most potential voters continued distrusting Political Parties and felt the only way to be heard was through violence. As such, young people in Ardoyne and other Nationalist areas marked the anniversary of Internment with Bonfires that always resulted in riots between youths and British Troops. Throughout the summer months, young people collected and gathered wood for a number of bonfires to be lit at Midnight on August 9. After the 1980 & 1981 Hunger-Strikes, both the Provisional IRA and INLA used riots as opportunities to cunduct operations against the British and RUC. A deadly mix of emotions that almost always left many within the district, shot and wounded by live rounds, Plastic Bullets and heavy batons. In one such riot, the RUC shot and killed young Bone resident, Seamus Duffy (15) in Dawson Street, off the New Lodge Road on August 8th, 1989. On the afternoon of August 8th 1988, a few comrades and I had been standing in the garden of 100 Brompton Park, the Sinn Fein Centre in Ardoyne. Enjoying the summer’s weather, when we noticed a car slowing down and a man in the back looking suspiciously at us as it sped away. A short distance away, a lorry had just delivered drinks to the Highfield Social Club and was leaving for it’s next job. A number of local youths standing outside Whelan’s Shop in Etna Drive, were sharing a yarn. When a UVF man alighted from the sunroof of the car armed with an automatic rifle and directed his fire at them. As they dived for cover, eighteen year-old, Seamus Morris from Highbury Gardens. His younger brother, Conor and a friend luckily survived. As chaos reigned, the car attempted to make good it’s escape but found it’s way blocked by the same lorry and was forced to mount the footpath. The lorry driver and his helper had courageously decided to ram the getaway car. As it drove up the kerb, the gunman again opened fire into the cab of the lorry and killed it’s passenger, Peter Dolan (32) from West Belfast. I didn’t know Seamus well, we attended different Schools. However, he was a very nice person and never passed you by without a hello. He was known locally as a quiet fella, very intelligent and had worked in the Civil Service. As with nearly everyone killed from the locality by Loyalists, Seamus had absolutly no connection to Republicanism and was clearly a victim of a random sectarian shooting. The two murders were eventually admitted by the Protesstant Action Force (PAF), a cover-name for the UVF. The death of Seamus had a devastating impact on his family and his Mother contracted cancer soon afterwards and died four years later. His Dad never recovered and couldn’t even speak about his son. Therefore, I’m proud to announce on this Blog that on his and Peter’s 25th anniversary a Plague will be unveiled outside Whelan’s Shop on August Sunday 11th, August at 1pm. The details of which I publish below. I would encourage everyone to please attend and show solidarity with both families. In another event to mark Internment, the Anti-Internment League has organised a large march which will leave Ardoyne Avenue at 6pm on Friday 9th, August. The parade will proceed down the Oldpark Road, Rosepenna Street, Cliftonville Road, Antrim Road, New Lodge Road, North Queen Street, Donegall Street, Royal Avenue, up Castle Street onto Divis Street where it will meet other marchers and bands. The march will then proceed up the Falls Road, Anderstown Road and into the Busy Bee, where a Rally will be held to recall those incarcerated between 1971 and 1975. It will also focus on Political Prisoners currently held behind bars like Martin Corey and others Interned by Remand. Where POWs’ can be held up to 3 years before trial. The march has been endorsed by a number of Republican Political Groups, such as the Irish Republican Socialist Party (IRSP), Republican Network for Unity (RNU), Eirigi, the 1916 Societies and the 32 County Sovereignty Movement. Once again, I would ask anyone with an interest in Human Rights to please attend the above march and demonstrate your opposition to Internment.